Forces, moments and temperatures are measured and transmitted by a multi-channel telemetry device. Results of the measurements with hip, knee, shoulder and spine implants are presented as video clips. 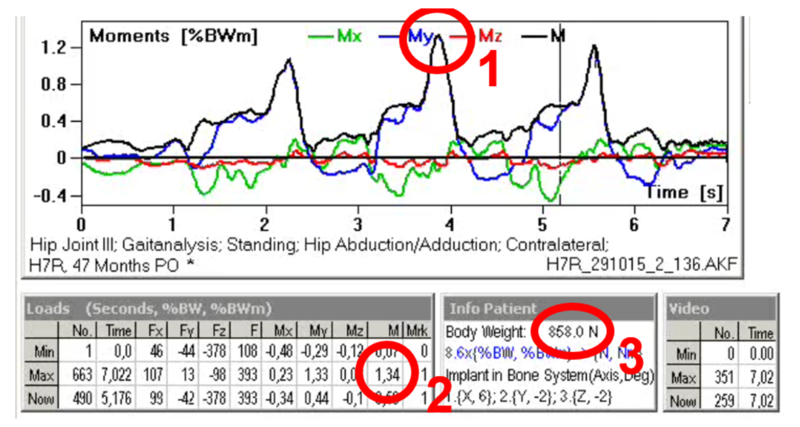 Bergmann G., Bender A., Dymke J., Duda G.N., Damm P.
Selected data samples of the in vivo measured hip joint loads are available at the OrthoLoad Database. In the diagrams and tables the moments are given in the dimension %BWm (percent of body weight times meter). To get the value of the highest moment Mmax (1) in the dimension Nm instead, multiply the value of Mmax in %BW*m (2) with 1% of the BW in N (3). In the example, the maximum moment is Mmax = 1.34 * 8.58 Nm = 11.5 Nm. 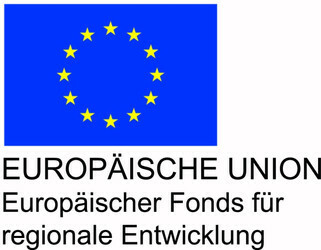 In 2016 the project OrthoLoadLab was supported by the European Regional Development Fund (EFRE) represented by Berlin – Senate Department for Education, Youth and Science of Berlin. It involves the establishment and operation of a globally unique, functional analysis service in the field of movement research. Basis was the joint proposal of the Julius Wolff Institute, the Center for Musculoskeletal Surgery of the Charité and the Department of Exercise and Movement Sciences at the Humboldt University in Berlin. The support allow the construction of the OrthoLoadLab, a unique laboratory that combines classical movement analysis with a 3D x-ray fluoroscopy in a virtual environment. This results in new approaches and analysis options in biomechanical research and application. Aim of the OrthoLoadLab is the direct translation of science and research into industrial development and clinical application. It offers their partners a globally unique combination of in-depth scientific know-how on in vivo-acting loads and functions combined with the outcome data from the clinical-scientific environment. Fluoroscopic images and motion analysis are used to quantify joint kinematics. In the clinical environment, it is checked to what extent the desired functionality of the implant is actually achieved. Furthermore, it gives their partners access to the unique, scientifically-based OrthoLoad data collection that they can use as a basis for product development, review and approval. The OrthoLoadLab ensures a direct exchange between product developers, scientists and clinical staff. In this way, current questions about implant safety can be answered taking into account the increased patient and approval requirements for future implant developments. In addition, the functional outcome of innovative implants can be analysed and specific risk factors recorded. In direct combination with the already established “OrthoLoad Club” the OrthoLoadLab also offers a safety forum for manufacturers, developers and users for the benefit assessment of implants. Under realistic physiological conditions, the performance of established implant systems or new developments can be optimized. As a result, companies are able to significantly reduce their development time for new products.